NIAGARA-ON-THE-LAKE, July 26, 2013 – Premiers are committed to a fair and inclusive society where citizens have access to public services that support their well-being and help them contribute to the social and economic fabric of society. Premiers agreed on the importance of ensuring that all Canadians living with disabilities have the supports necessary to fully participate in the economic and social life of our communities. 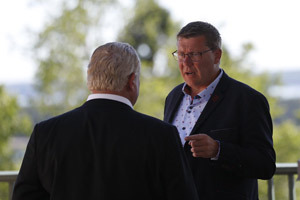 Premiers directed social service ministers to accelerate their work on disability systems supports and report back on options and recommendations. 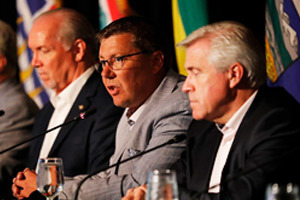 Premiers recognized the challenges associated with mental illness and its effects on all sectors of society. They highlighted the importance of an integrated and coordinated approach to mental health services within each jurisdiction. Building on discussions at the 2012 Mental Health Summit held in Winnipeg, Premiers directed ministers responsible to host a meeting of private and public sector leaders on workplace mental health and wellness in 2013. 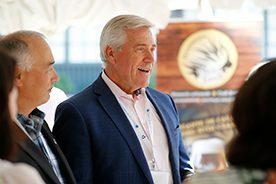 Premiers also directed ministers to continue to develop best-practices for mental health promotion and mental illness prevention and identify how approaches, treatments and supports can be shared across jurisdictions to reach all individuals and communities, including in Aboriginal and remote regions. 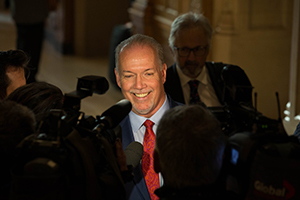 Premiers underscored the importance of access to affordable and social housing. They acknowledged that although measures are in place, these measures are insufficient. They called on the federal government to work with ministers of housing on a long-term federal funding commitment for housing, which would outline a comprehensive and sustainable strategy to effectively meet the country’s diverse housing needs for both today and future generations. Québec’s Premier indicated that her government intends to make its own representations to the federal government. 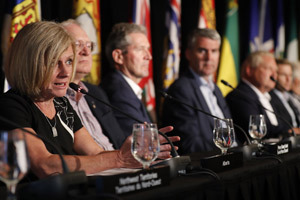 Premiers discussed Canada’s retirement income system and the importance of continued efforts to ensure tomorrow’s seniors are able to retire with secure and adequate income. Premiers agreed on the need to consider options for enhancing the retirement income system including the Canada Pension Plan/Québec Pension Plan and the Pooled Registered Pension Plans. A modest, phased-in and fully funded expansion of CPP/QPP would increase retirement income for future retirees, and is consistent with efforts to improve labour mobility and enhance labour market efficiency. Premiers noted concern with the increase by the federal government of the age of eligibility for Old Age Security and the Guaranteed Income Supplement from 65 to 67, as this will result in more Canadians requiring social assistance in order to meet a basic standard of living. Premiers noted the commitment by the federal government to compensate provinces and territories for any net additional costs and look forward to engaging the federal government on this issue.